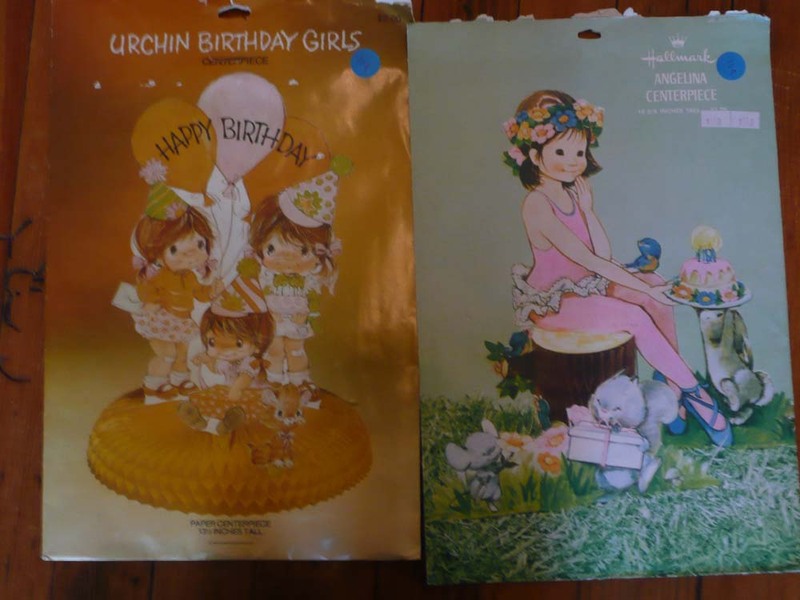 I had the opportunity to shop at two new-to-me thrift shops last week and I absolutely loved them! I spent the day out with a friend and we literally spent all day at these two shops. Thankfully, she looks for entirely different things than I do so we don’t get in each others way. 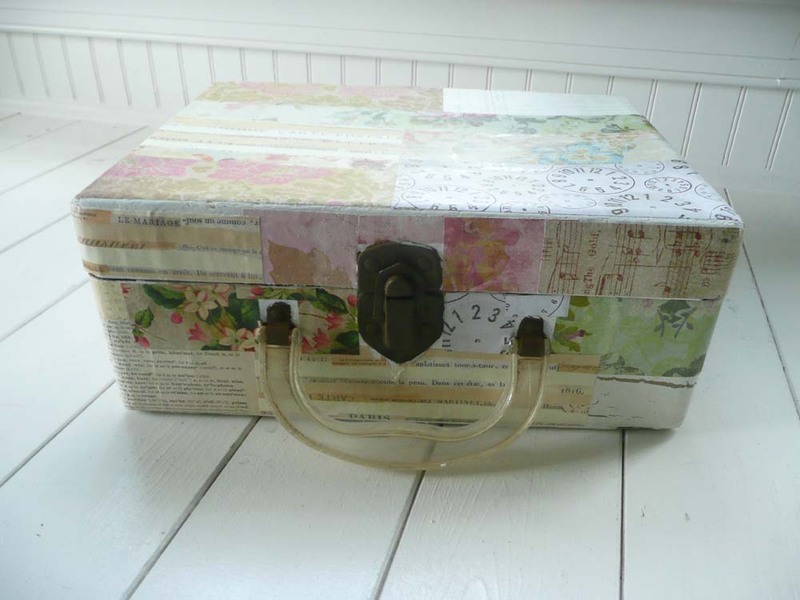 There are things that will be sold by Mossy Cottage and there are things that will be used for crafting. So without anymore ado, here’s what I found. The cutest Valentine’s Day fabric ever! 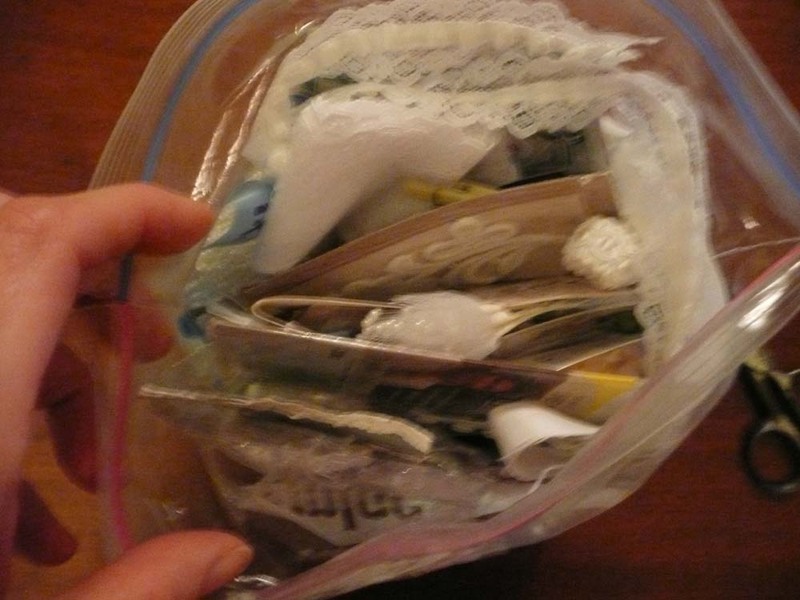 Stamps, pipe cleaners, envelopes, and old tape measure and various other craft supplies. Close up of the stamps I bought. 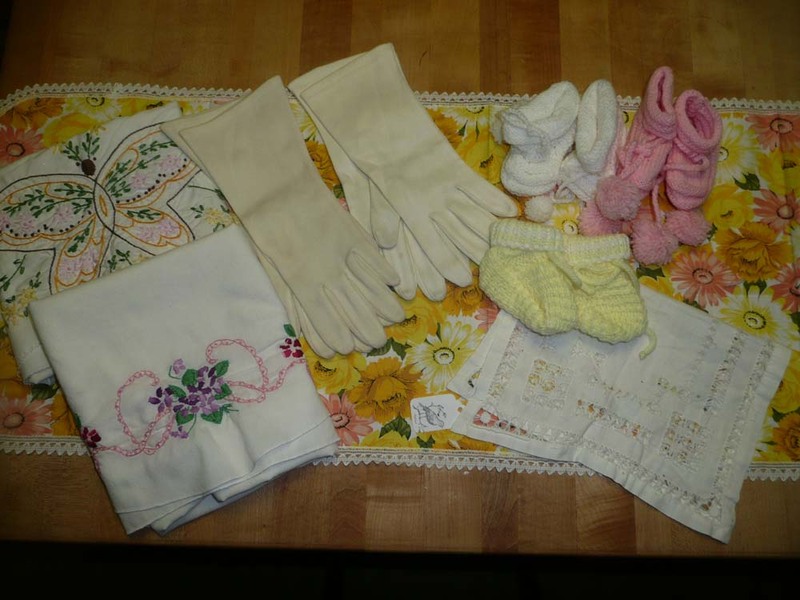 Vintage gloves, rosy invitations, a jewelry keeper and a get well card. Pyrex plates, a wood puzzle, satin lingerie keeper, glove box. 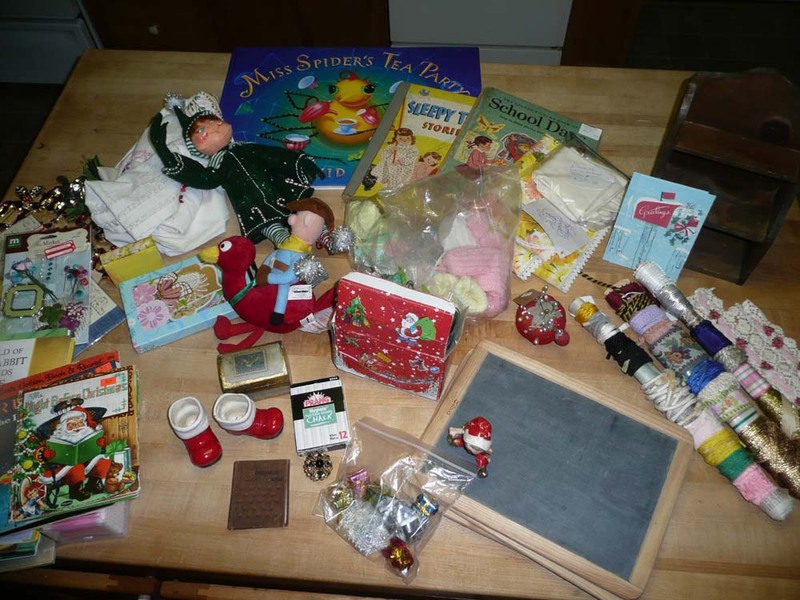 pill box hat , figurine and child’s book. Two cute bird tins, a green metal planter, a lidded jar and a bottle of Chanel No. 22. A hand made jointed teddy and a set of six retro plastic coffee mugs. This bunch of eyelash trim was a freebie given to me by the friend I went shopping with!!! I also got a cute crocheted vest by Chico’s and an awesome black cashmere sweater. Those things are definitely for personal use! I just love everything I got and a lot of the Mossy Cottage items will be for sale at the upcoming Big Flea in Fredericksburg (see my upcoming events page). I hope you had fun looking and hope you get your own chance to do some thrifting soon. Yesterday was a totally fun yet freezing day. 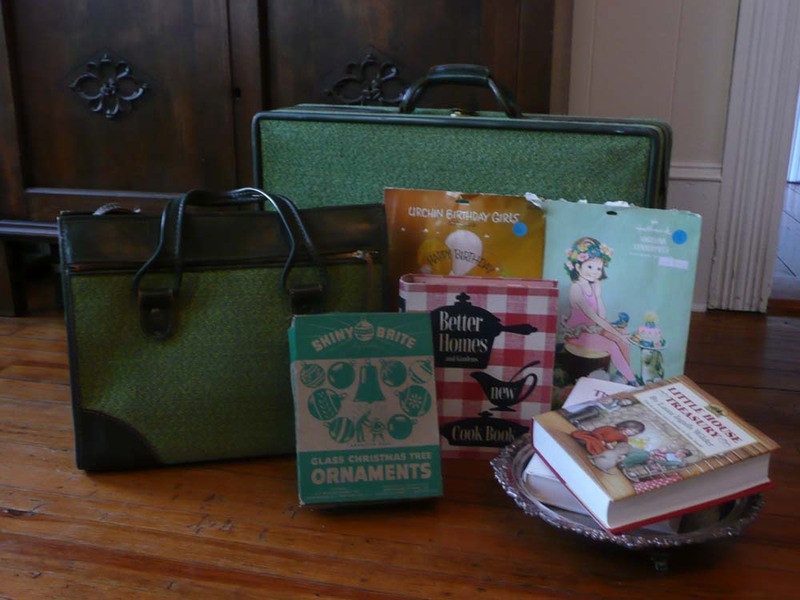 My friends Barb and Juliana went flea marketing with me in Richmond. To an outdoor flea market. Did I mention it was freezing? But you know what? When you start digging through boxes of treasures and looking at all the goodies you kind of forget your pain, right? No, but you plug on anyway. 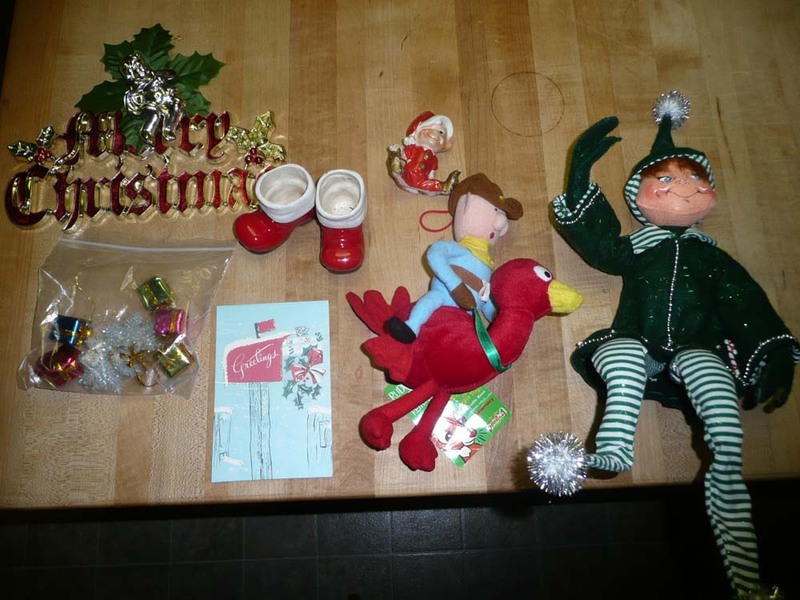 Here is what I got at the flea market and the antique mall we stopped at on the way back. A lot of great stuff to sort through. Just look at all those flea market treasures! I need to break it all down for you so you can wallow in all the vintage goodness. Who needs an IPad when you can have these? 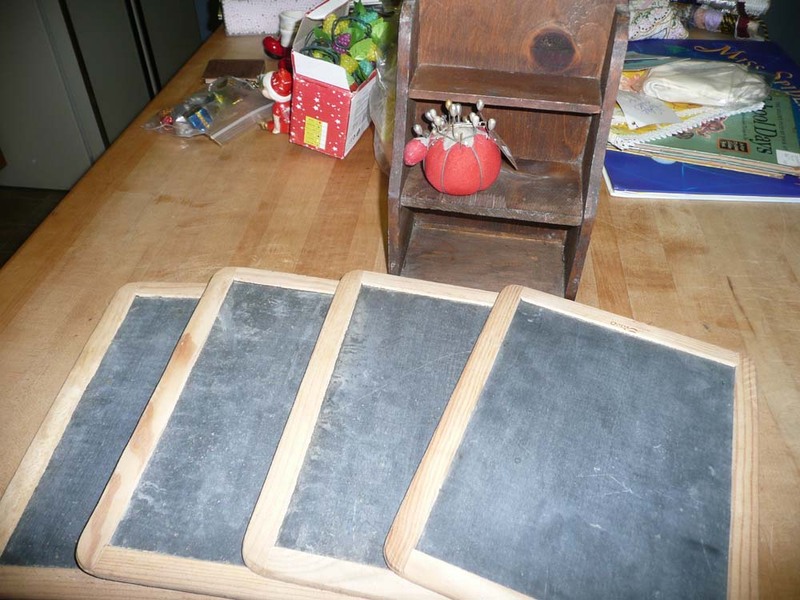 I got these four chalk boards that were made in Portugal. Who knew the Portuguese are expert chalkboard makers? Not me! And I got the prim little wooden shelf because, well it’s a shelf and who doesn’t need another shelf? The tomato pin cushion is filled with stick pins I can up-cycle for journal and mini-album covers. 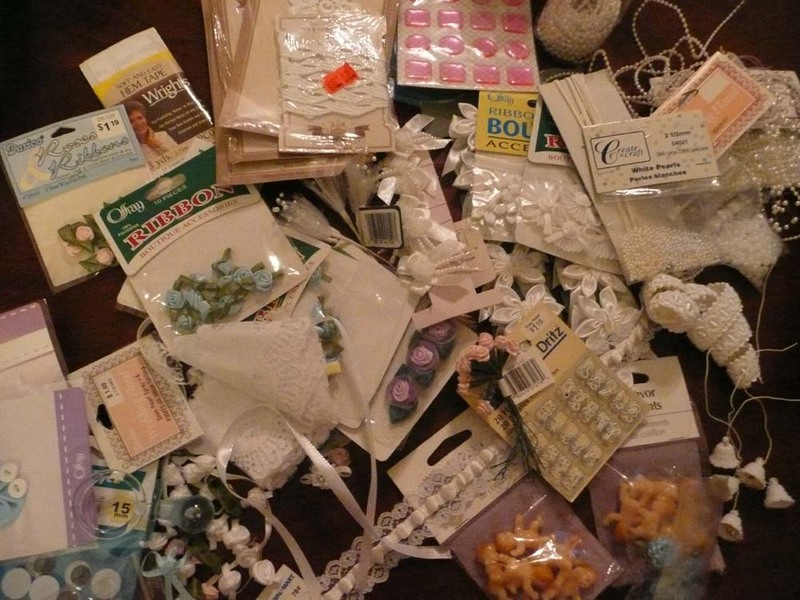 There was a really nice lady who was selling all kinds of crafting stuff for 25 cents a package but since I already have enough crafting stuff I just walked away. NOT!!! I did refrain from buying the whole bag for $10.00 though and I thought that was pretty good of me. But I did dig through the bag picking out some things I could use. I stopped picking when I could no longer feel my fingers because they were frozen. Getting my money out of my bag was a comedy of errors and I had to dash after a stack of $5.00 bills the wind took out of my numb hands. For an old lady I can still move pretty quickly, especially when I’m chasing flying money!!! Well, after I recovered my flying money and my dignity, I noticed a stack of books on the same lady’s table. She said all the books were just 50 cents each. Hello! 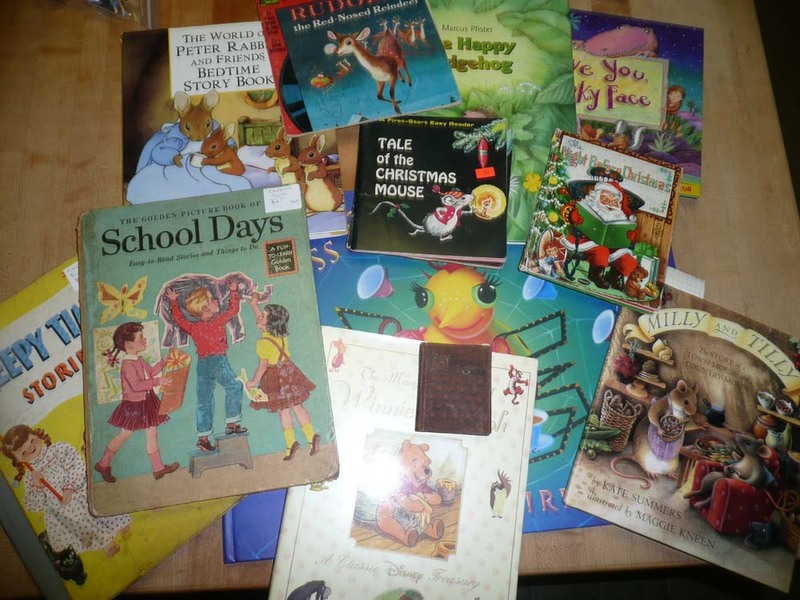 I got some beautiful books that looked brand new like the Pooh Treasury book and a Beatrice Potter book. 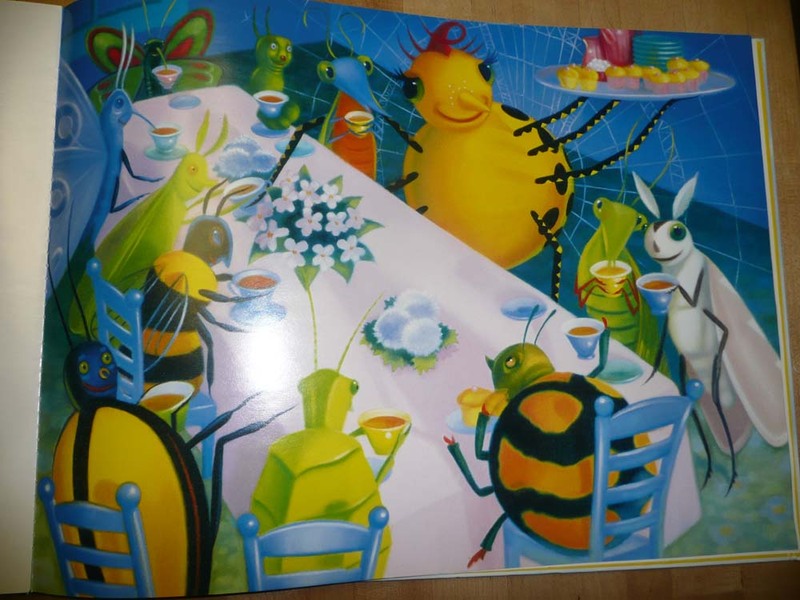 I also got a book called Miss Spider’s Tea Party. This book was $1.00 because it is MASSIVE. I have never seen such a big book. Although the book is in great condition I bought it with destruction in mind. I want to take the pages with graphics out and hang them in my laundry room. No kidding, the pictures are poster size. Look! Now how cute is that? Look at it. Just look at it! I’m sorry, you could not stay in a bad mood after looking at a picture like this unless your heart is made of stone. So the nice lady got more of my money and I walked away with a big smile on my face and an even bigger book. What I was really looking for though were linens and lace. I did end up finding a few linens throughout the day. My favorite linen buy is the bright 1960’s table runner on the bottom. It will add a lot of color to my Spring shop displays. 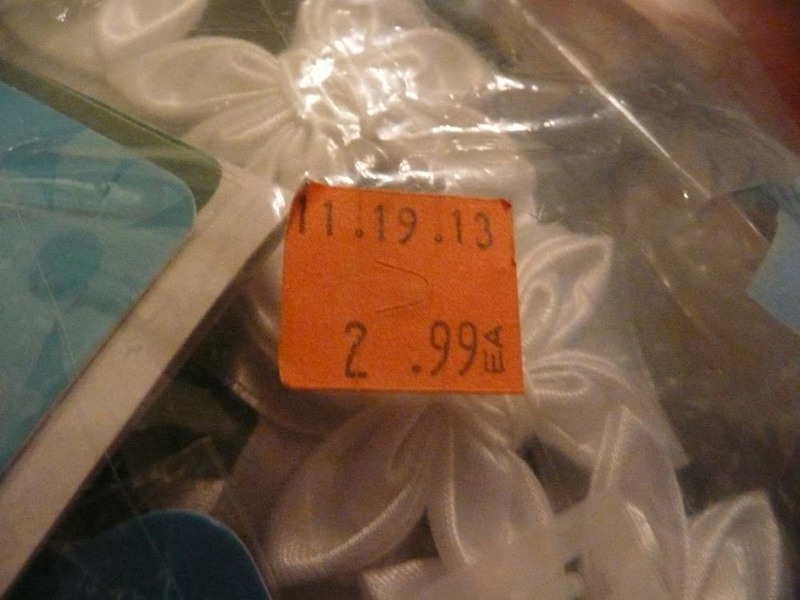 I didn’t find a single piece of lace at the flea market so I was kind of bummed about that. But when we went to the antique mall I found this! I know, don’t hyper-ventilate like I did when I saw these. Juliana actually found this box first and she bought two of the paper rolls of trim first. 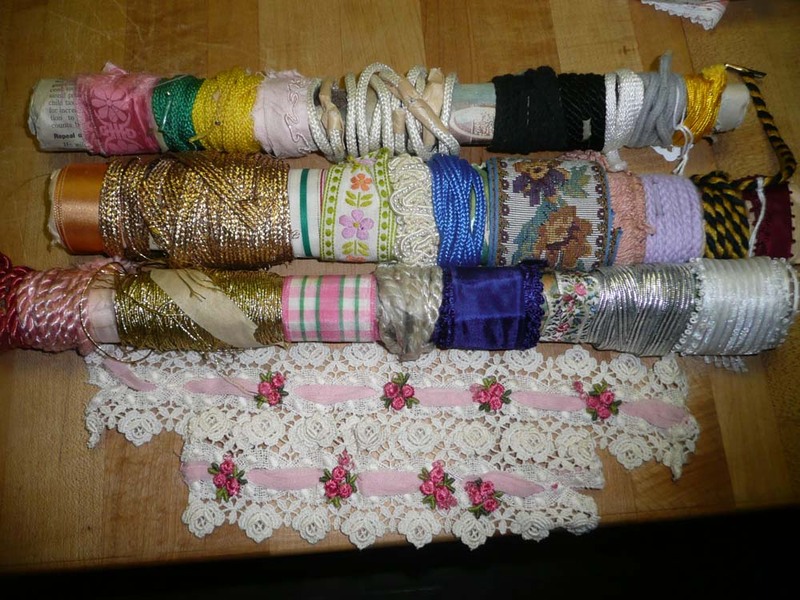 And some of the trims are actually no more than shoe laces but for 75 cents a roll who could resist. I had to ask the vendor twice that they were only 75 cents a whole roll and not by trim type. I heard angels singing when she said it was indeed only 75 cents per paper tubey thingy. After selecting my three tubey thingies I found the two pieces of lace with the little roses on it. They are by far, no doubt about it, hands down my absolute favorite find of the day!!! I LOVE them. When I asked the vendor how much they were she said I could just HAVE them. Juliana and Barb almost had to do CPR on me. I told the lady I could not just “HAVE” them because they are so awesome. I told her I must give her something for the happiness she was providing me. I told her I would give her another 75 cents, the same price as her tubey thingies, for these two precious pieces of eye candy. She laughed at me. 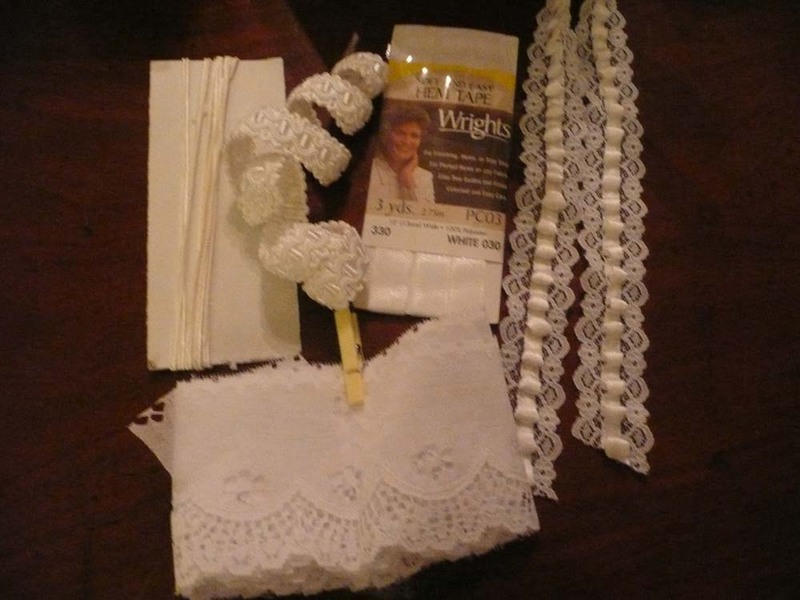 Some people just don’t understand people with LOD (lace obsession disorder). I swore I would not buy anymore Christmas stuff this year because the shop is full of it and I really don’t want to have to store the leftovers until next year. 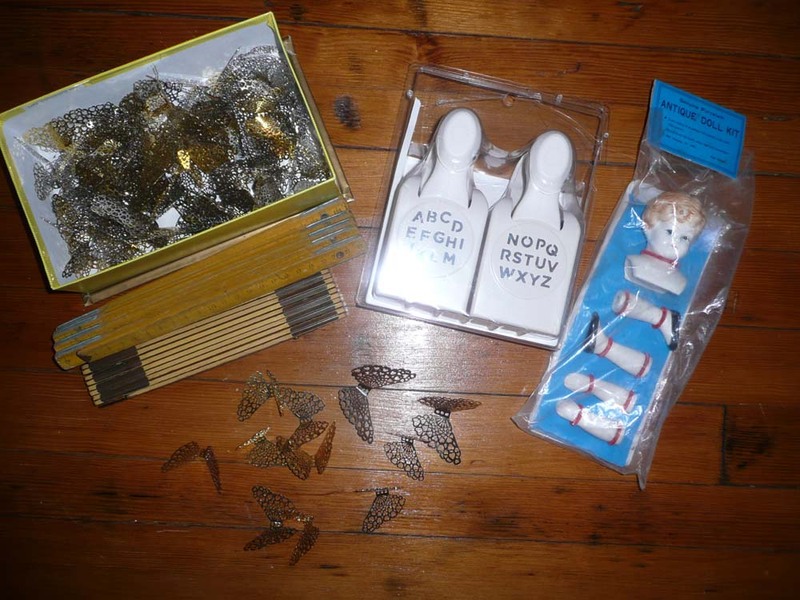 So here is the Christmas stuff I ended up buying. I have no words for this lot. Not one word. And last but not least, here are the things that really don’t fall into any other category of stuff I bought. Yes, there is a big box of PINK Q-tips. I don’t think I really need to explain why I bought those. I bought a beautiful vintage Austrian crystal brooch from a dealer who obviously doesn’t know the value of good old costume jewelry! I’m just saying. The little Italian lacquer box is a stocking stuffer for my mother-in-law because it is an old souvenir from Austria. Yes, she is Austrian and no, I didn’t spoil the surprise because she doesn’t read my blog. The box of chalk is for my Sunday School room because we write our prayer requests on the board each week. The last piece of chalk we have is so small it’s hard to hold never mind write with! Now, the plastic fruit (grapes or raspberries?) are in this category because I thought they were your run-of-the-mill plastic fruit lights that had been put in the wrong box (pictured above the lights). But no! I plugged them in to see if they work and my breath was just taken away. You see, not only do they alternately flash on and off, but they play “Jingle Bells” at the speed of sound!!! I was actually confused at all the noise and action when I plugged them in. Could somebody please explain to me what flashing fruit (grapes or raspberries?) have to do with jingle bells. I know I can be dense sometimes but I’m just not making the connection here. Now you can see from all these great purchases that the early frozen bird gets the worm! 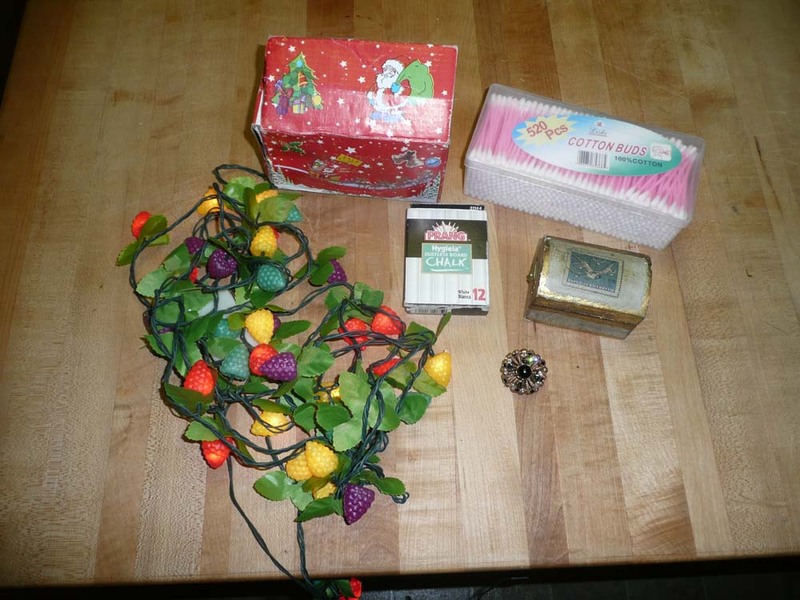 So don’t let the bitter, cold and damp weather deter you from flea marketing because you may miss the opportunity to buy a set of “Jingle Bells” flashing fruit lights of your own! Okay it’s confession time. 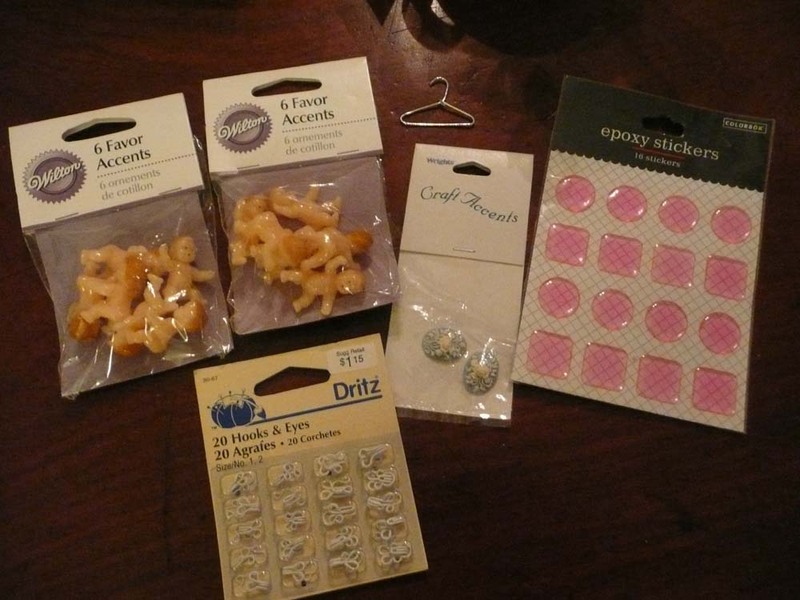 I promised myself I would not buy ANY MORE craft supplies until I made a BIG dent in the ones I already have. I mean really. My office/studio is a total disaster because there is so much stuff that I don’t have enough storage space for it all. I am a neat freak and it is really starting to get on my nerves. So that is why I made an iron clad promise to myself that I would use up what I have, not only to make some space, but to save some money as well. It was all going so well until I went to the Goodwill today and found this! 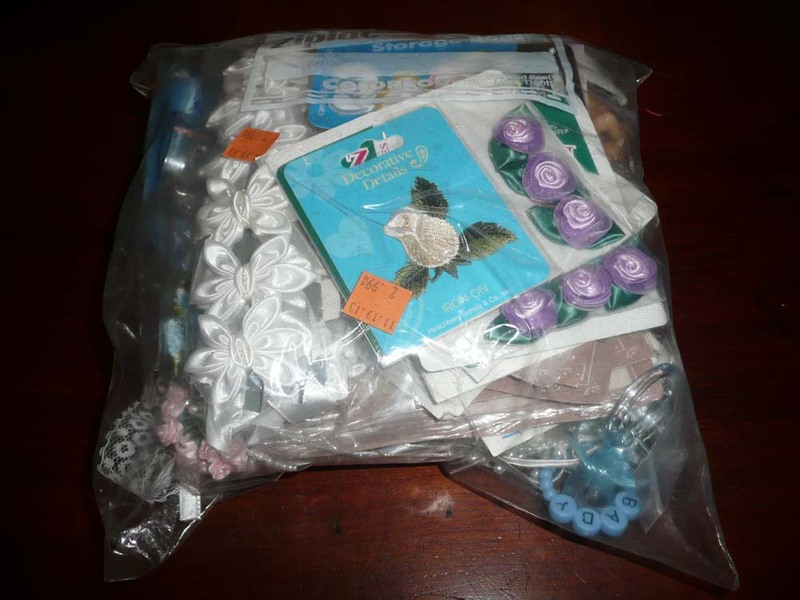 It’s a big bag of crafty embellishment type of thingies. For about 3 pounds of goodies, the price was right. Goodwill had taped the bag shut with packing tape and I couldn’t really see what was in the middle. I took a gamble and laid down my $2.99 anyway. So I decided to look at the contents with you. Wow! That’s a lot of embellishments. Let me sort them out a little and we’ll see what we’ve got here. Some of the items didn’t make “the cut” and will be for sale at my next yard sale!!! First, some fairly flat ribbons and flowers. These are great for putting on journal and album covers. 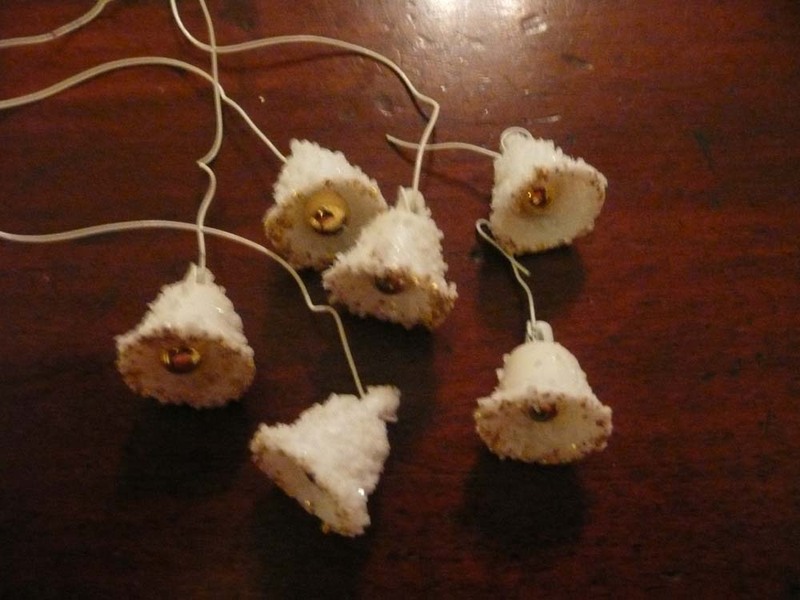 These frosty little bells are on wires so they will be perfect to use in next year’s Christmas corsages. 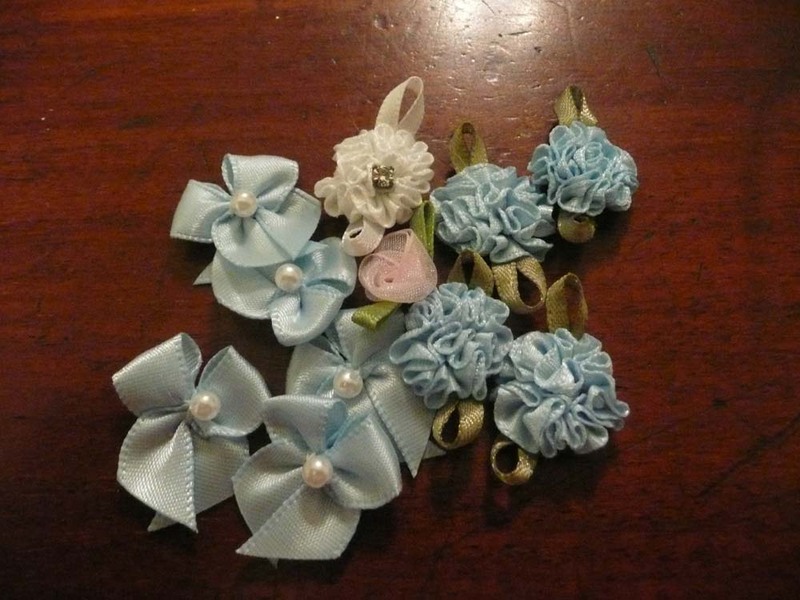 Side note, I had intended to make some corsages this year, however, I completely ran out of time. Could it be because I was thrift shopping? 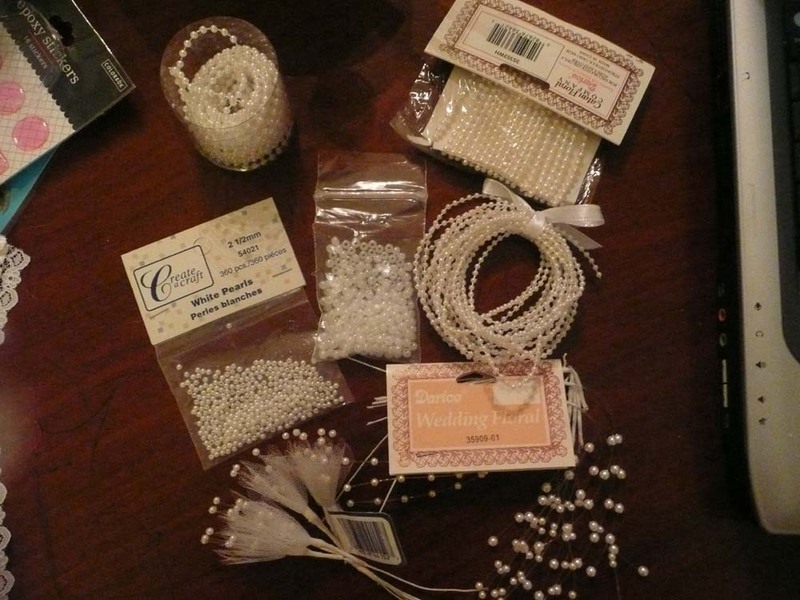 Strings of pearls, pearl sprays and pearl beads. There are at least 1000 uses for these! 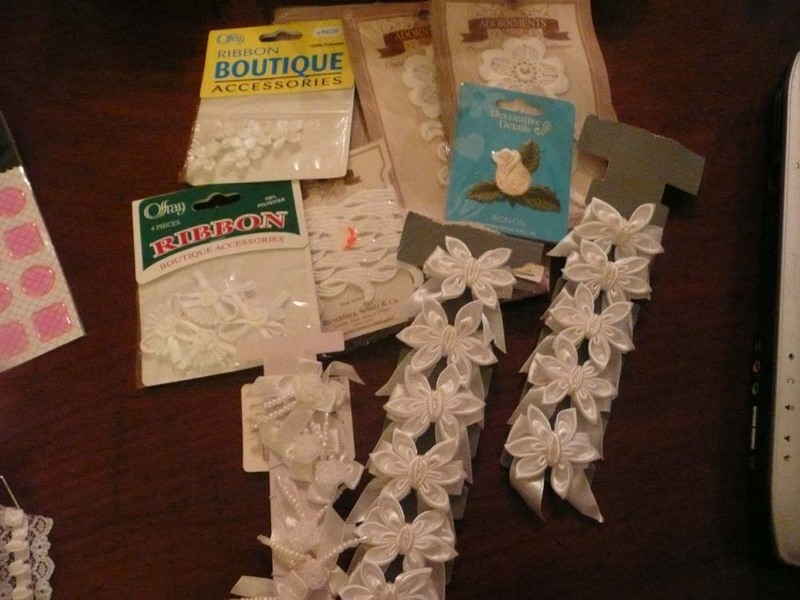 Packages and packages of flat white embellishments made from lace and satin. The fact that they are all white is okay with me as I can always spray them with glimmer mists to add color. 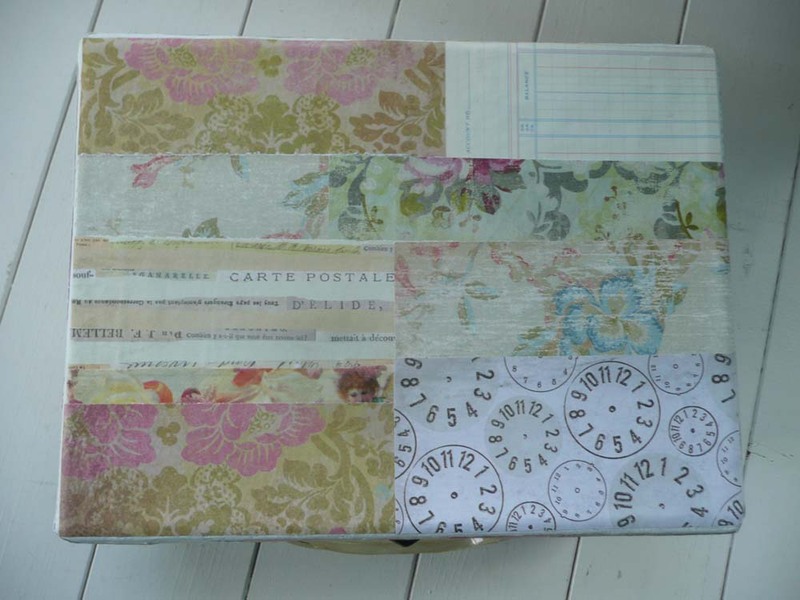 Lace trims, cord and seam binding tape. Again, all white and ready to be colored. Last but not least some other items. There are two bags of naked babies which will be fun to use on Spring crafts. Two blue and white cameo type cabochons. A package of pink epoxy stickers (need I say more)? Some hook and eye closures for a future sewing project, one of which I already had in mind. And last but not least, a tiny little metal clothes hanger! How cute is that? Well I have to say that even though I’m disappointed with myself for breaking my “no more buying craft supplies” rule, I am happy that I spotted such a great buy. So now that I’ve added to my big mess, I must go watch youtube crafting videos make something fabulous! Today was a beautiful fall day. The perfect day for yard sales, however, I had to drive Adam quite a distance to work for a friends dad. I was on the road with him driving for 45 minutes just watching all the yard sales go by. As I am going rafting in West Virginia tomorrow, I was resolute NOT to spend my money at yard sales anyway. After I dropped Adam off I was going to drive straight home and get some crafting projects finished before I leave. But oh, the Siren song of the yard sales. I couldn’t resist. So I stopped at a few. Okay, I stopped at a lot, but some were real duds. So here are some quick pictures of the treasures I found today. Some of the bigger haul items. 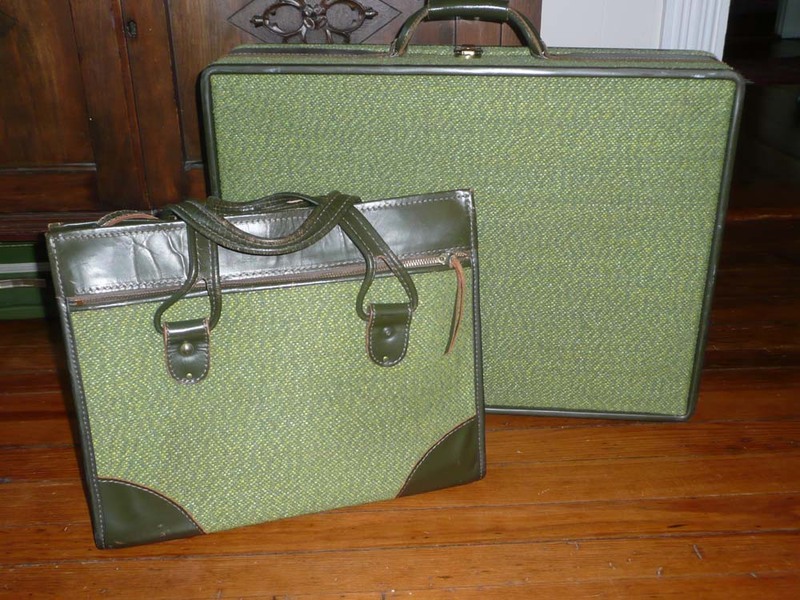 Awesome vintage Hartman luggage with tweed fabric and real leather. 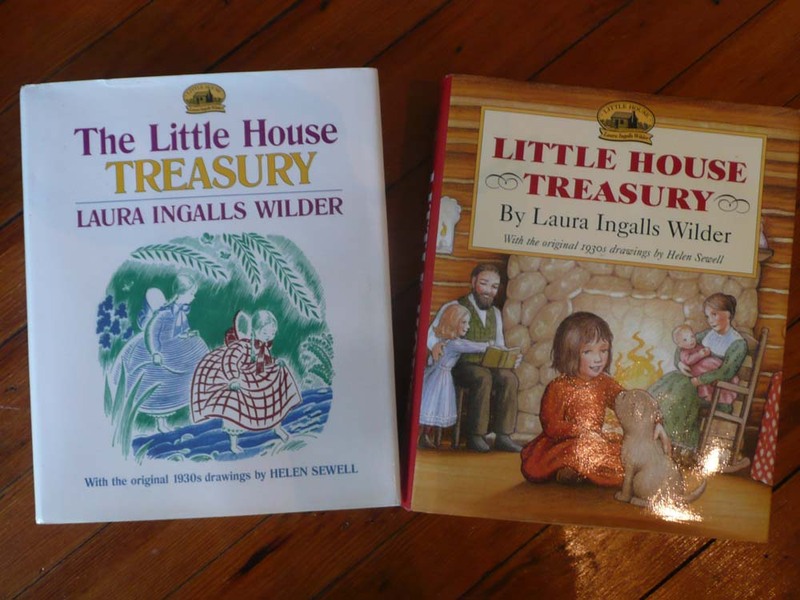 Two thick Little House Treasury Books with Illustrations from the 1930’s. Two vintage centerpieces with accordion tissue paper bases. Box of Shiny Brite ornaments. 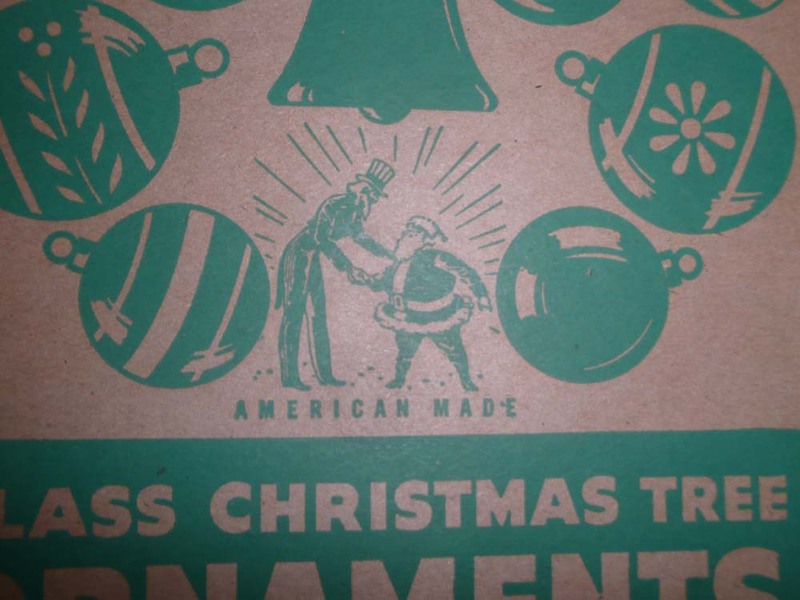 I love the Uncle Sam and Santa graphic which portrays they are made in America! 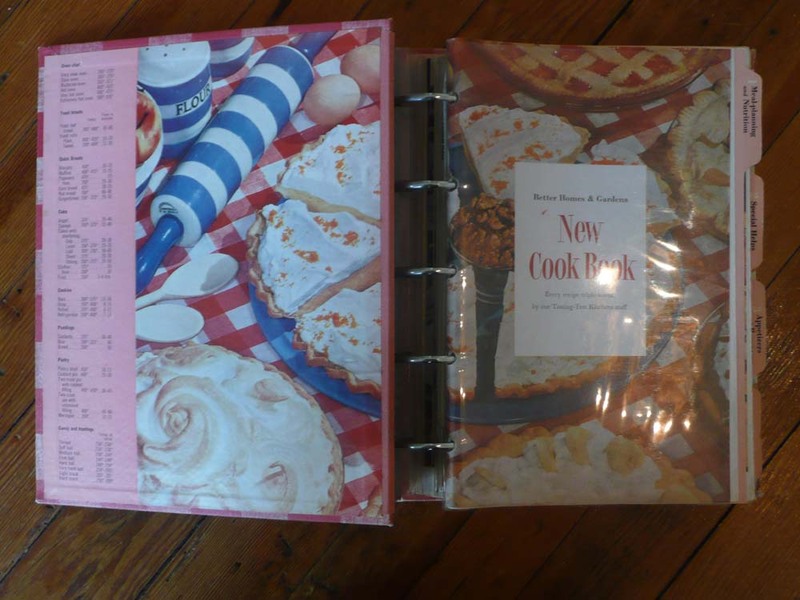 Inside of Better Homes and Garden cookbook from 1953. 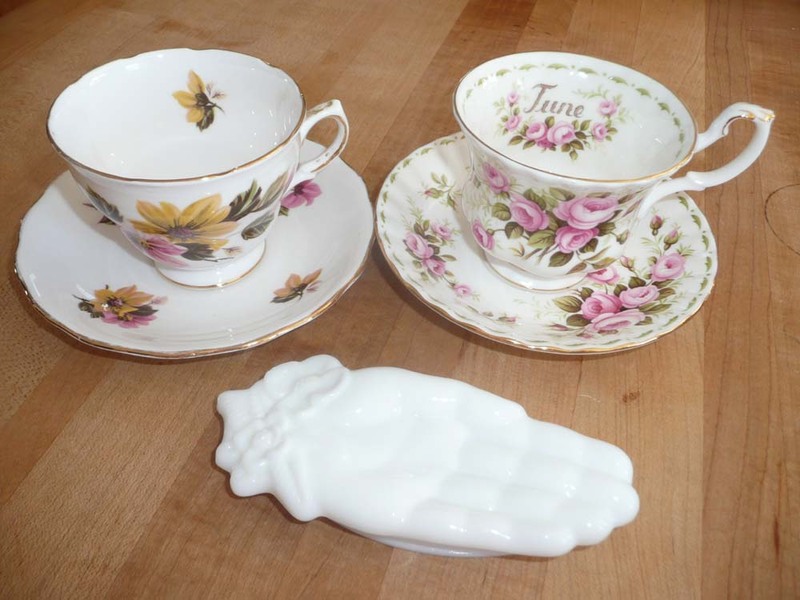 Two bone china tea cups and saucers and an Avon milk glass hand. 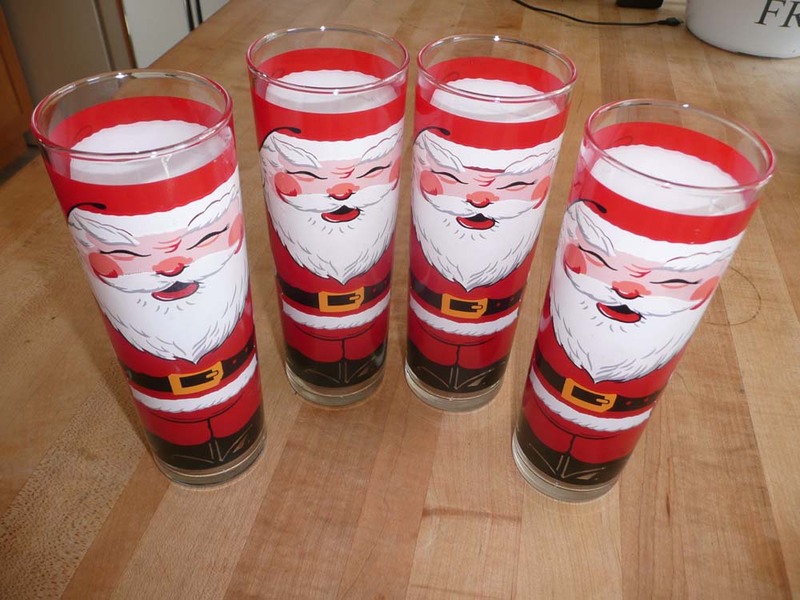 Four adorable vintage Santa glasses. 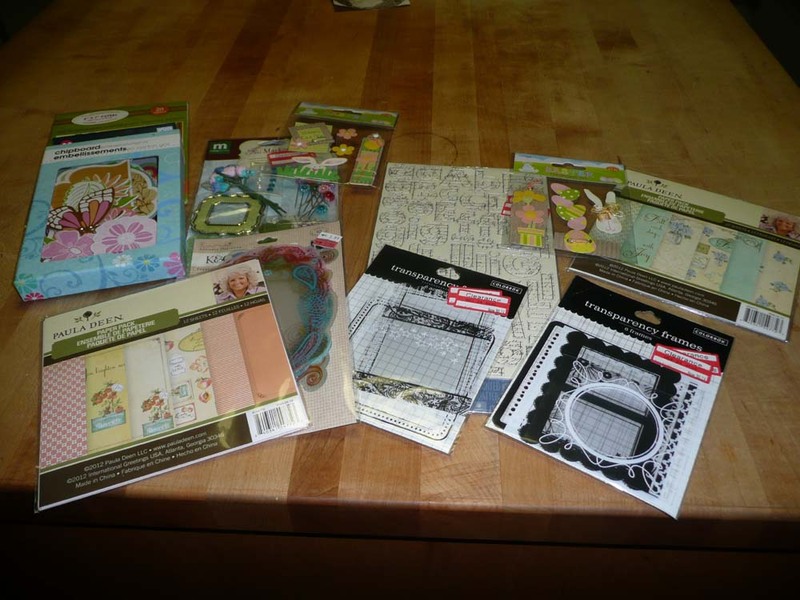 Crafting supplies I swore I would NOT buy because I have been buying way to many lately. Okay, so I don’t have a back bone when it comes to yard sales. And I really don’t have one when it comes to craft supplies from yard sales. Well, the good news is that I only spent $22.00 on the whole lot. That still leaves me plenty of cash NOT to spend at any flea markets I pass on my way to West Virginia tomorrow! Happy Labor Day everyone! Wow, has the summer ever blown by fast. I have had a very busy summer which included a cruise and a white-water rafting and zip-line trip to West Virginia. I also went to many flea markets, yard sales, estate sales and thrift shops. It was at one of these venues that I found this…. 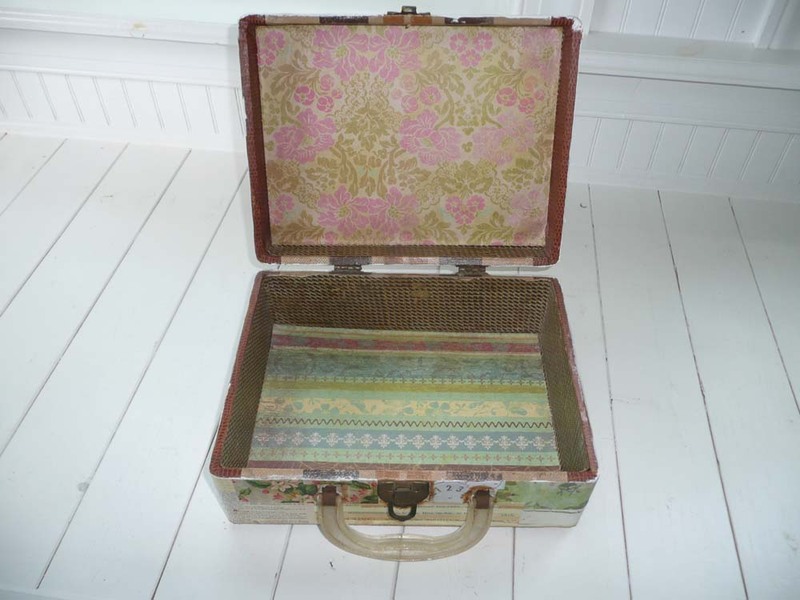 It is a sad little suitcase, probably for doll clothes. It is an old one, and certainly one that has seen better days, but then again, haven’t we all? 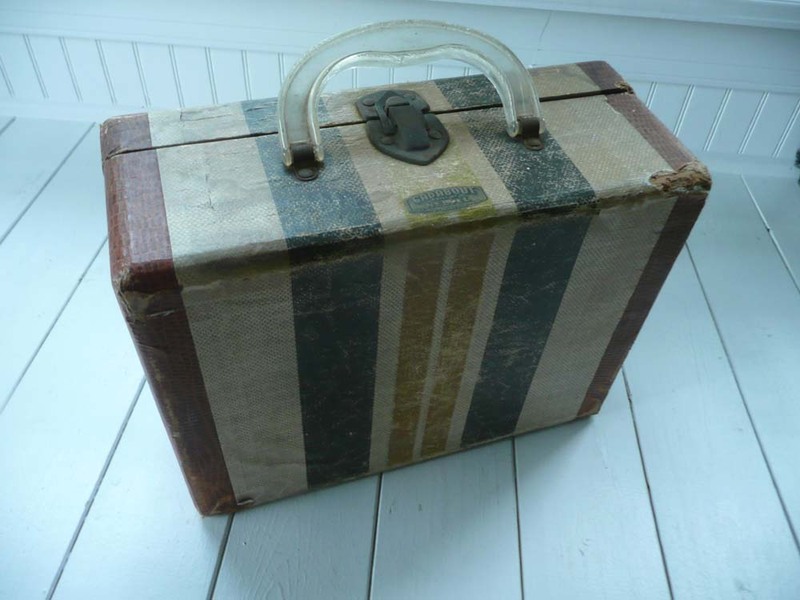 If you look at the top right corner of the case it even looks like a mouse might have sharpened his teeth on it! Why would I even consider spending good money on this? I had three reasons. First, it is sturdy and the hardware is all intact. Second, it only cost $1.00. And lastly, it is so sad I just couldn’t leave it to a fate of ever being tossed in the trash can, unused and unloved. 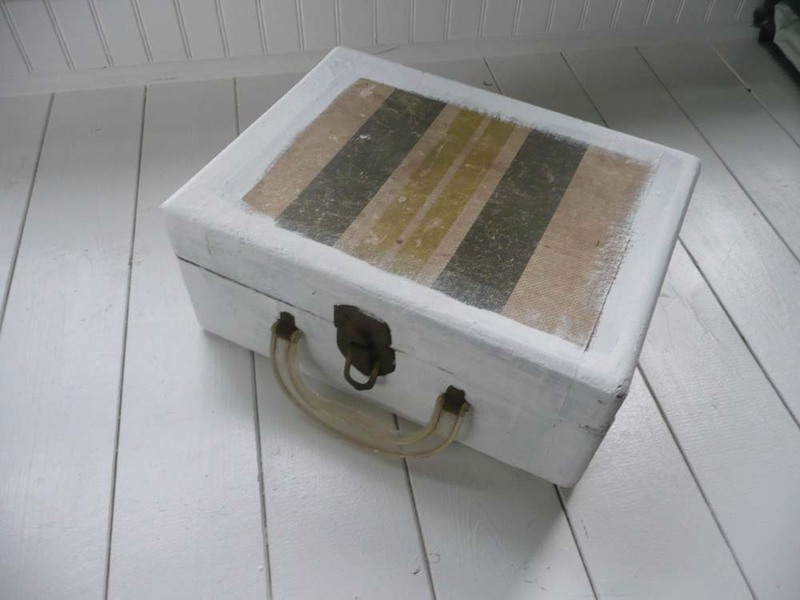 Yes, I really do get emotional about inanimate objects! But I could not leave it in this miserable state. I decided since I will never be able to afford a face-lift, this sad little case would get one instead. First, a coat of white paint around the edges and hardware. Sometimes you have to get ugly (or in this case uglier) before you get pretty. If you’ve ever had foil highlights put in your hair you know what I’m talking about. 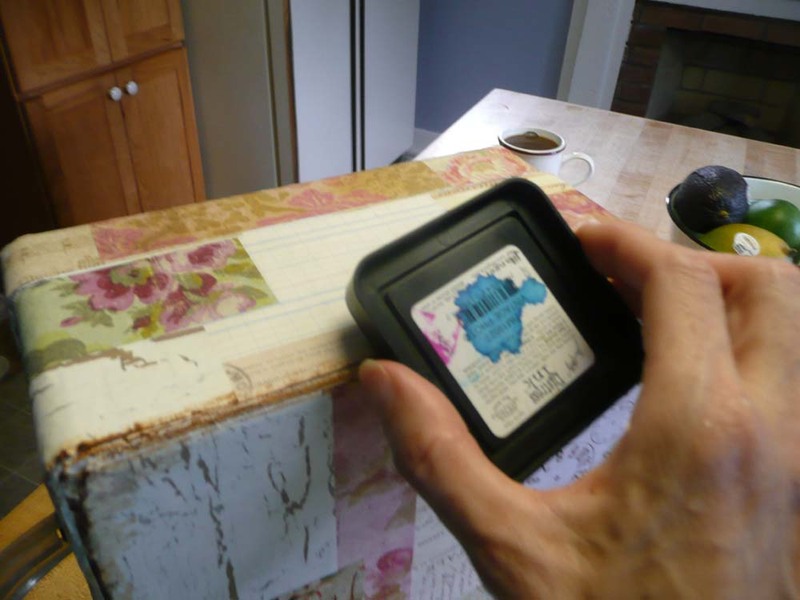 Then I applied a bunch of scrap papers around the whole case. This is a view of the top. And here is the front. As an afterthought I decided to cover up any white paint around the edges and hardware with some distress ink. It gives it a little more vintage flair. I wiped out the inside, which was not so bad, but it needed a little upgrade too. I just put some paper in the lid and in the bottom, but left the sides in their original state. I love how this sad little case ended up. Not so sad anymore! 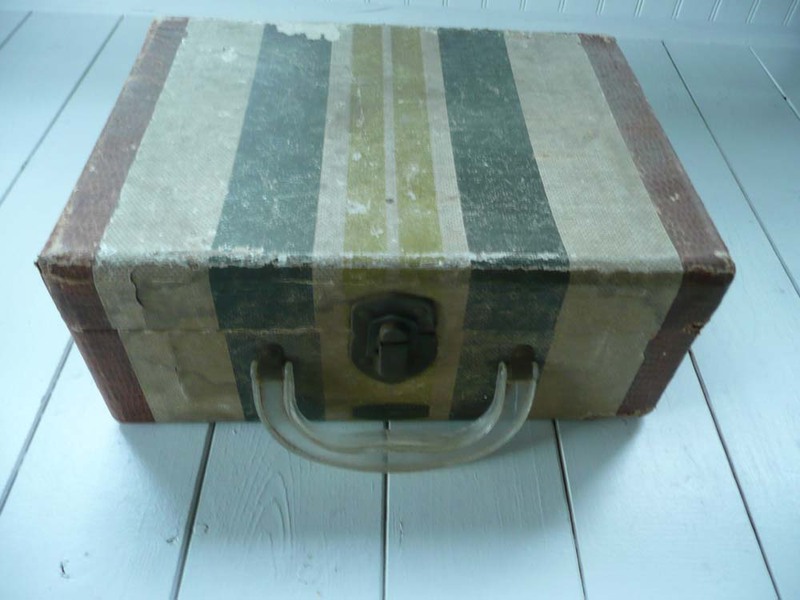 I am mainly going to use this case to carry art supplies when I go out (can anyone say, Donna Downey class in October!!!!). 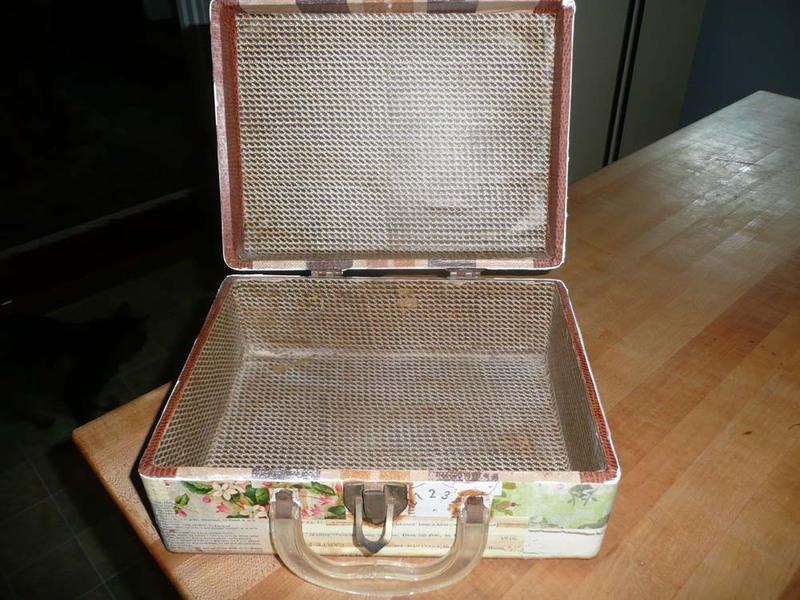 I was going to stamp some “arty” words inside the lid but decided I may also use it for displaying lace and such at vintage shows. I’m sorry my pictures do not do this little $1.00 beauty justice. She actually is quite pretty now. So my challenge to you is to take a chance and spend that whole dollar on the sad little object nobody else will buy. You never know, it could be a diamond in the rough!